This is the story of two people, madly in love with each other and destined to be together, on the adventure of a lifetime. 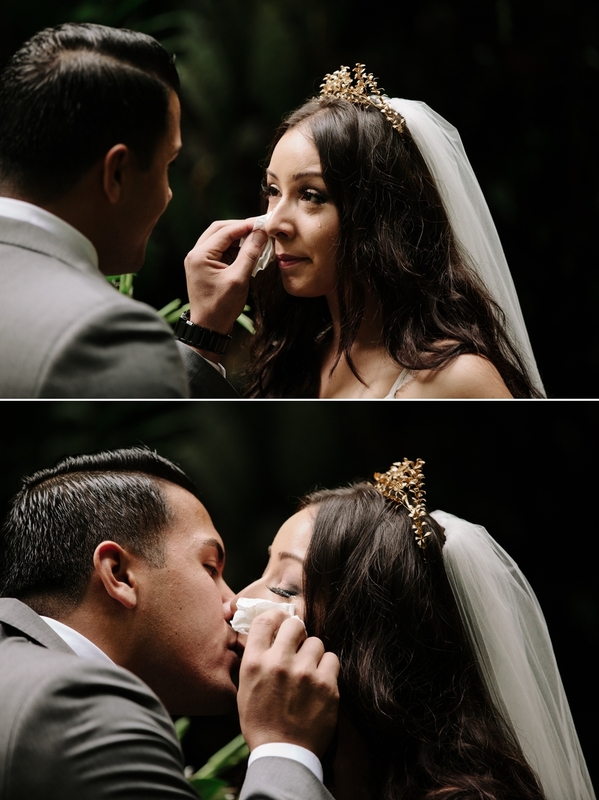 Words can’t describe how happy I am to have been invited along on their journey to document this fairytale of a day for them. 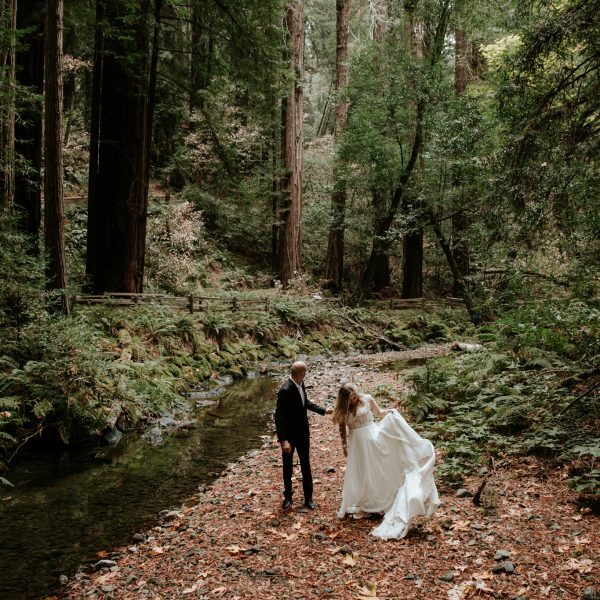 Ricky and Vanessa reached out to me at the beginning of this year, ready to elope to Yosemite together, even before a formal proposal happened. 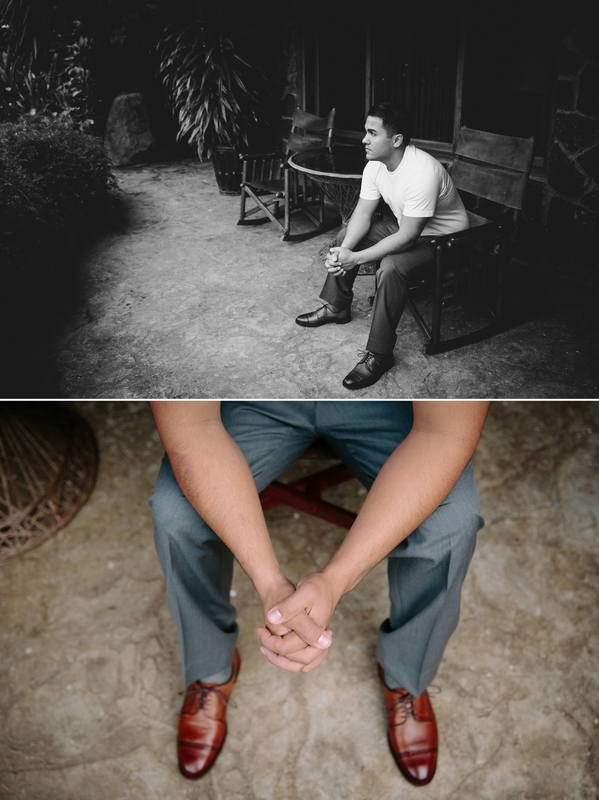 Ricky was eager to ask Vanessa to be his wife as soon as possible, that much was certain, and said he would get back to me as soon as he had something concrete planned. A few weeks went by and Ricky ended up pulling off the most epic proposal of all time. 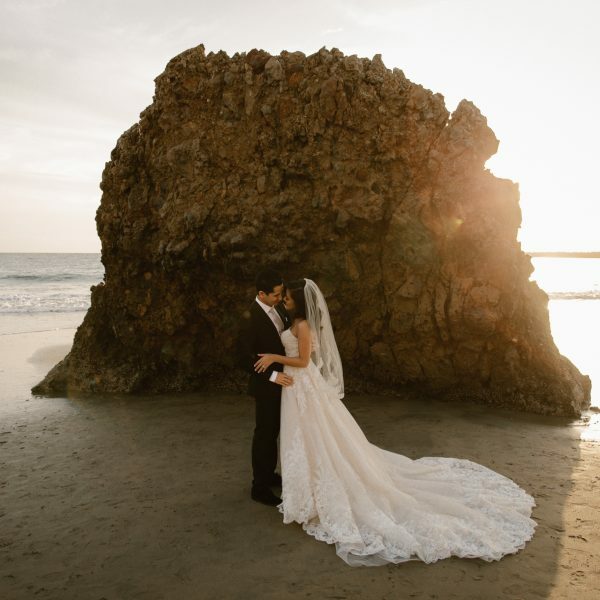 A romantic stroll to a secluded beach area in Laguna revealed a private dance floor and candlelit dinner, complete with a violinist performing the songs they fell in love to. 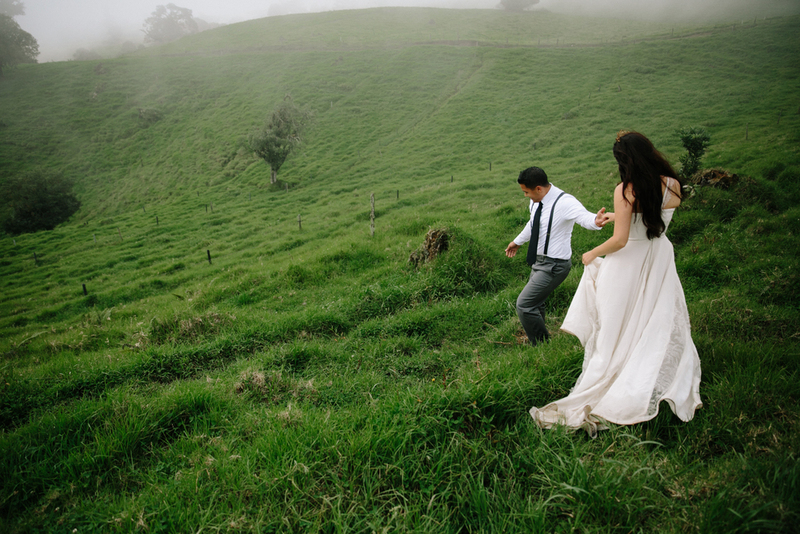 Vanessa had no idea what she was walking into, but she said yes, without a moment of hesitation. (Watch the video here). At the end of March, seemingly out of the blue, I got a text from Ricky that read “Hey Paige, how far are you willing to travel? 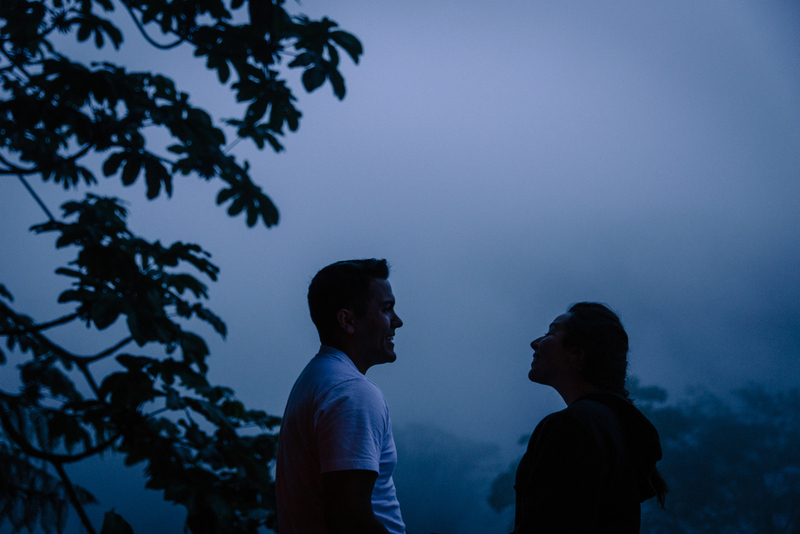 :)” Not missing a beat, I answered, “As far as you’re willing to take me!” And so came to fruition our escape to the lush Costa Rican rainforest mid-June. I was a little nervous traveling solo internationally for this one, but Ricky and Nessie’s family made me feel so welcomed and at home within their group. 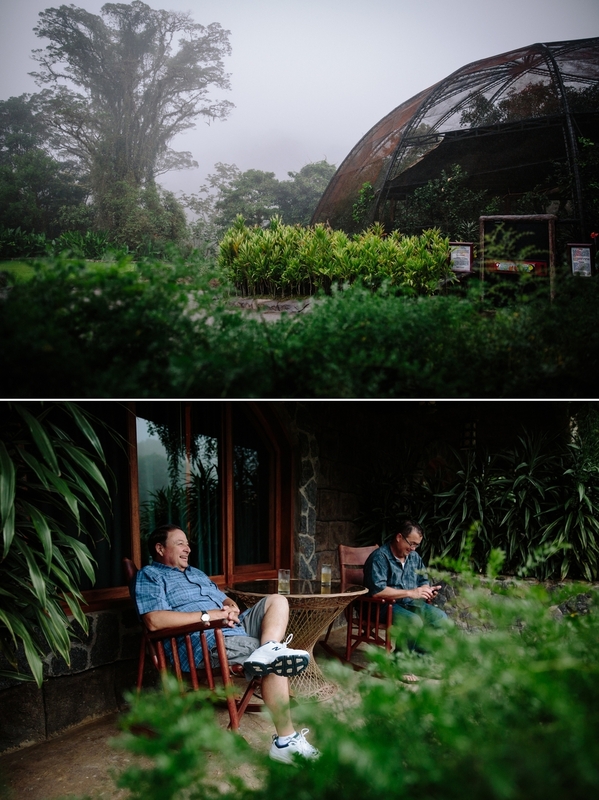 It was just 10 of us for their intimate wedding, lost in the magical cloud forest of Alajuela. 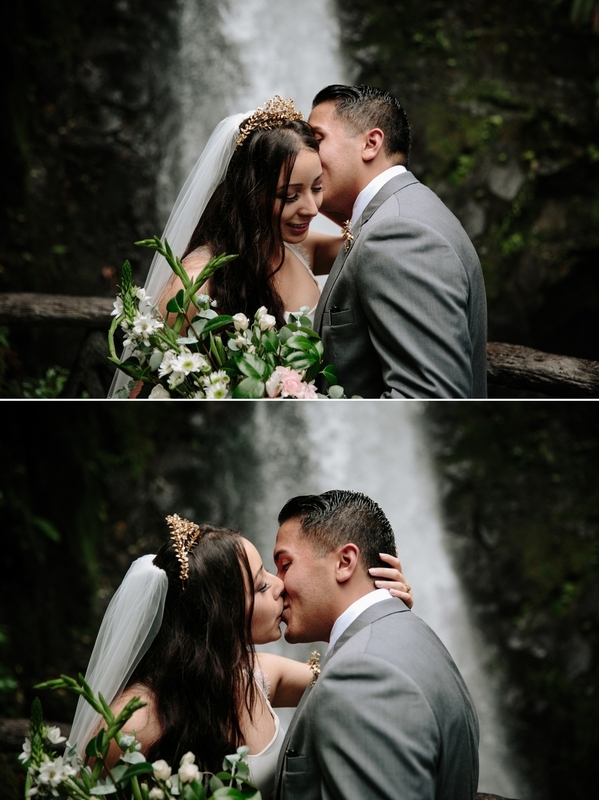 I arrived a few days early to get my bearings and tour their wedding venue, the renowned La Paz Waterfall Gardens and Peace Lodge, home to a wildlife rescue sanctuary, miles of trails through the rainforest, and 5 equally breathtaking waterfalls. 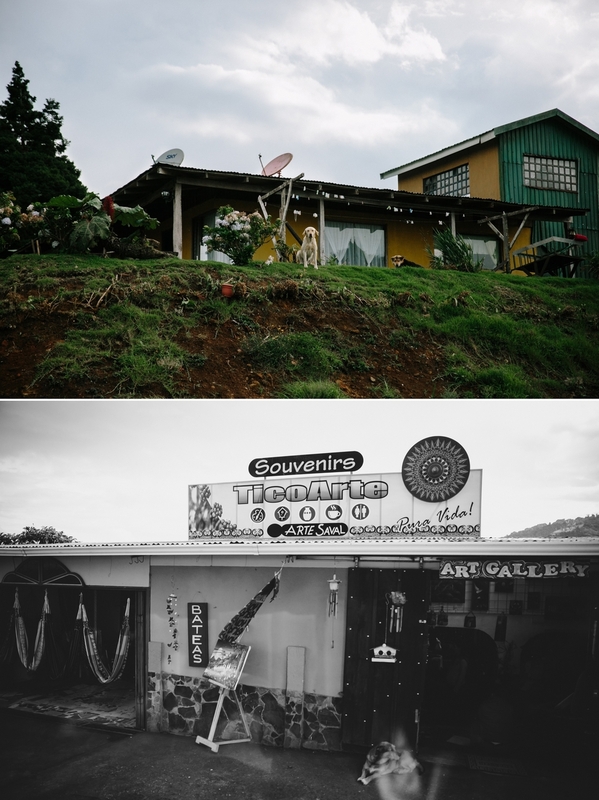 The sanctuary left a pretty great impression on us for our first ever visit to Costa Rica. We had a blast exploring together those first two days. All of us woke up groggy at the crack of dawn on the wedding day to share the long shuttle bus back up to the mountains. 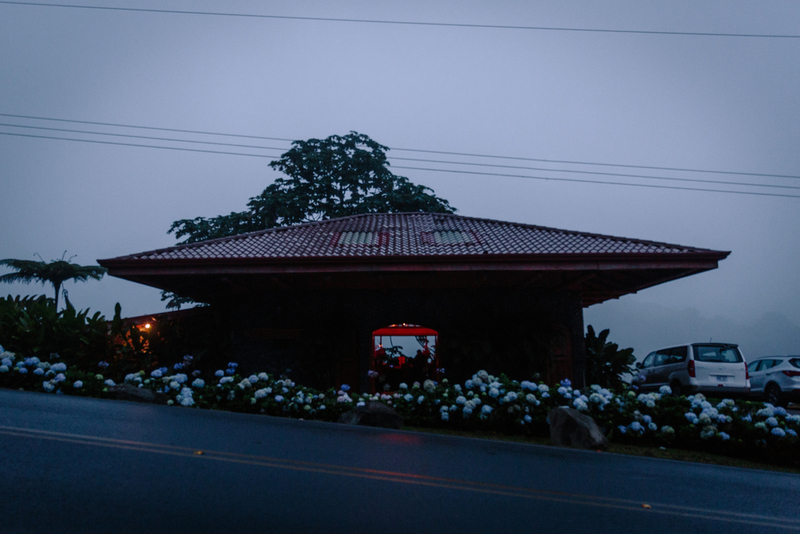 It was just around 4:30 a.m. when we pulled up to the Peace Lodge. A thick, blue fog blanketed our surroundings. It was surreal. The complex at the Peace Lodge had two conjoined rooms, separated by a door. Ricky and Nessie spent the quiet, rainy morning getting ready on separate sides. Anticipation and excitement hung in the air all morning long. 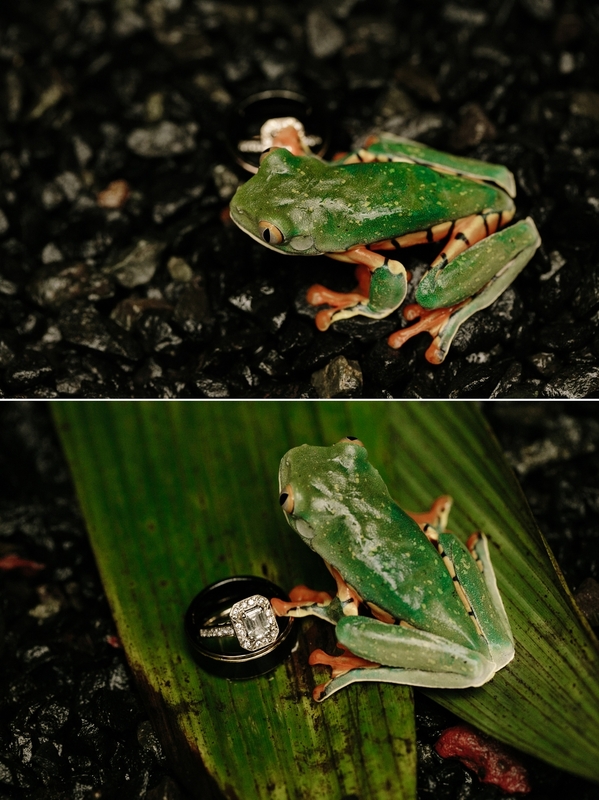 At around 10 a.m., the rain let up just in time for their first look. 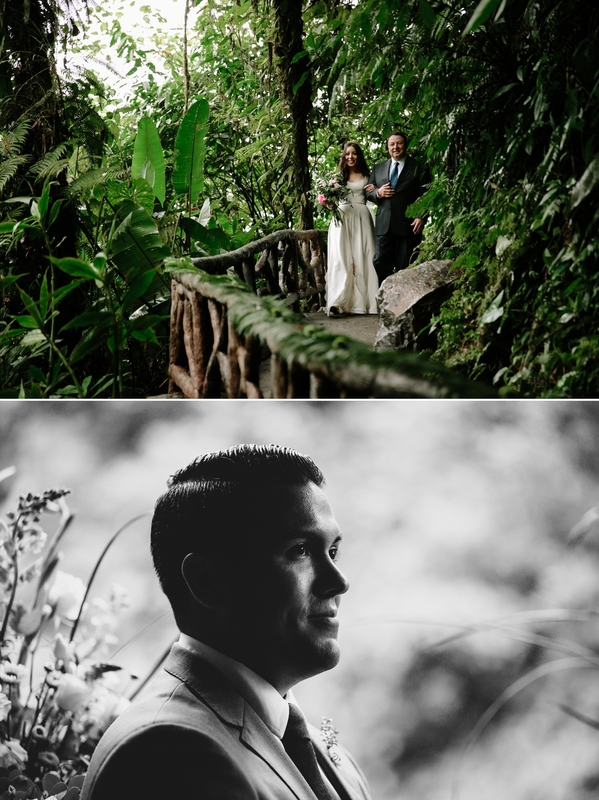 I followed Ricky through one of the green, mossy trails in the rainforest nearby to set him up on a bridge we had found exploring the gardens the day before. We made our way back to the lodge to meet up with the rest of the family and hop on another shuttle down to the most jaw dropping ceremony location ever. 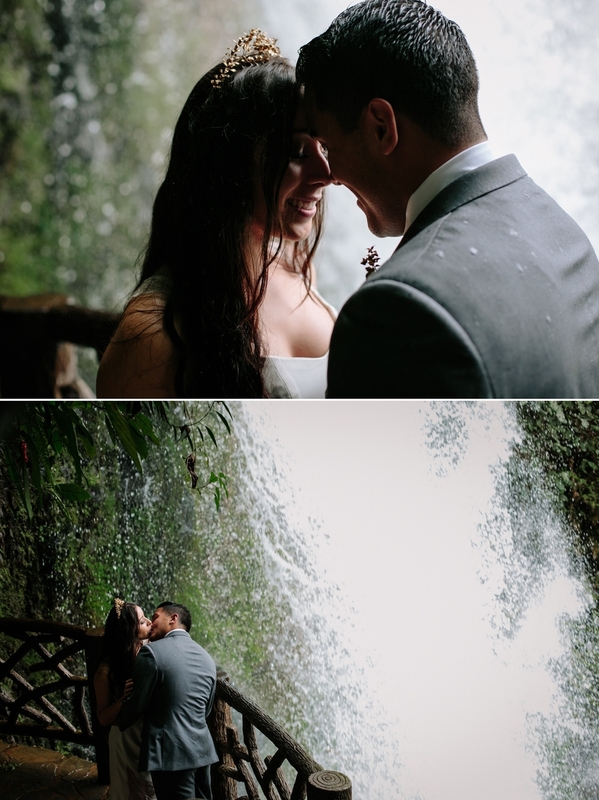 It was here Ricky and Nessie exchanged vows in front of their closest family, shaded by a mossy umbrella, while the Magia Blanca waterfall roared behind them. To make sure their family at home could be present too, Nessie’s brother, Ryan, set up two GoPros and a phone to live stream the whole thing. 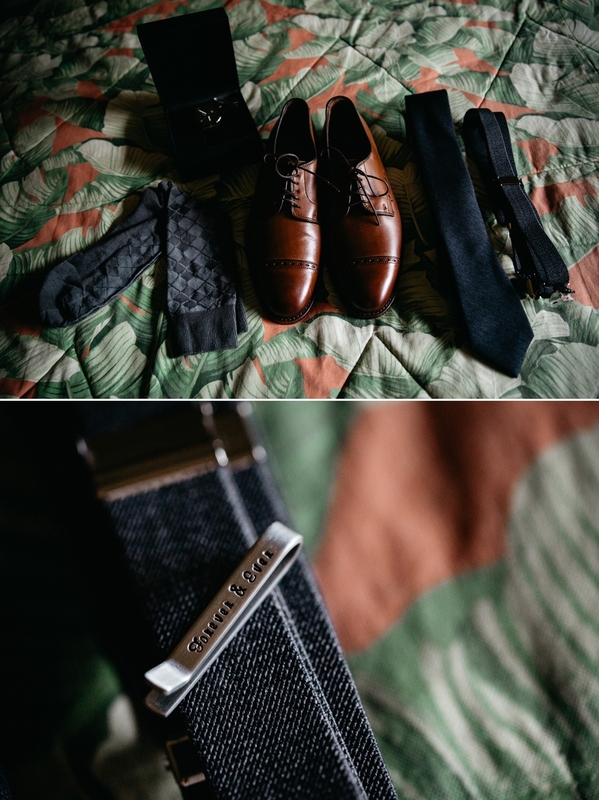 Poor Ryan…he was so happy to dust off a nice pair of vintage dress shoes in the closet, only for not one, but both, of the soles of the shoes to detach while he was walking. He tried to use the extra zip ties from the camera set up to reattach them, but to no avail. The legend of the talking shoes. 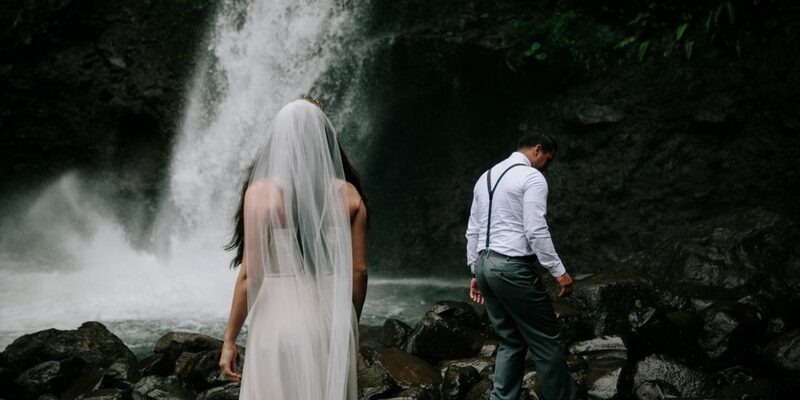 After signing the marriage license and many tearful hugs, Ricky, Nessie, Tina and I said a brief good bye to the rest of the family and headed up the waterfall trail. 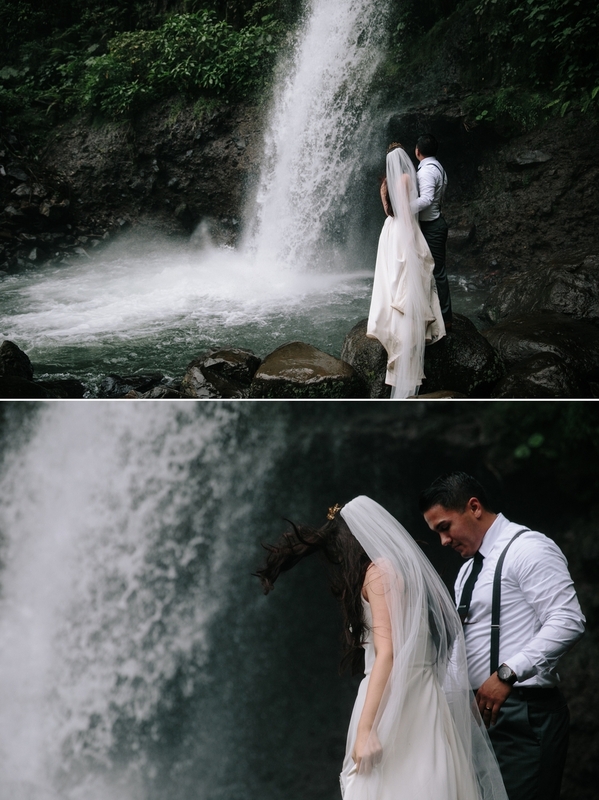 We had a small audience at the first waterfall, who all “oohed and aahed” at these two in their wedding attire. Ricky and Nessie couldn’t take their eyes off each other. It didn’t faze them one bit. When Vanessa was safely out of earshot, Ricky whispered to me about the next two surprises he had planned. First: humming birds. 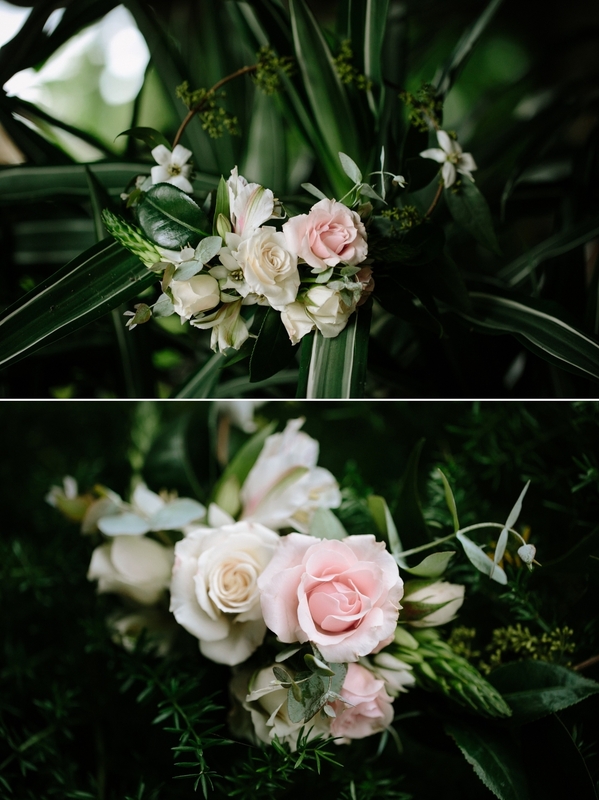 The coordinator placed several flower shaped feeders in her bouquet. These little guys flew up to us without ANY fear. I even had a chance to join in too and feel their little toes when they landed on my hand. It is still one of my favorite memories from this day. 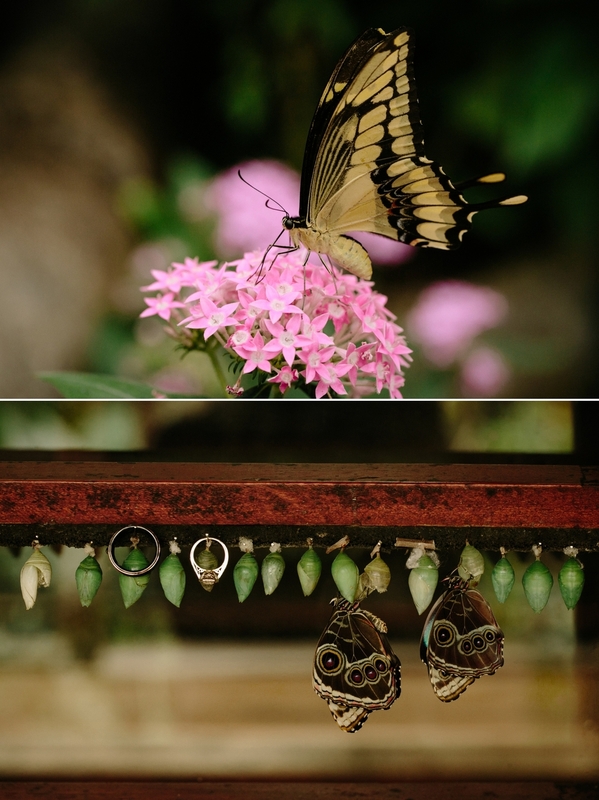 As if this wedding couldn’t get any more surreal…we paid a visit to the butterflies and the hanging fern garden next. 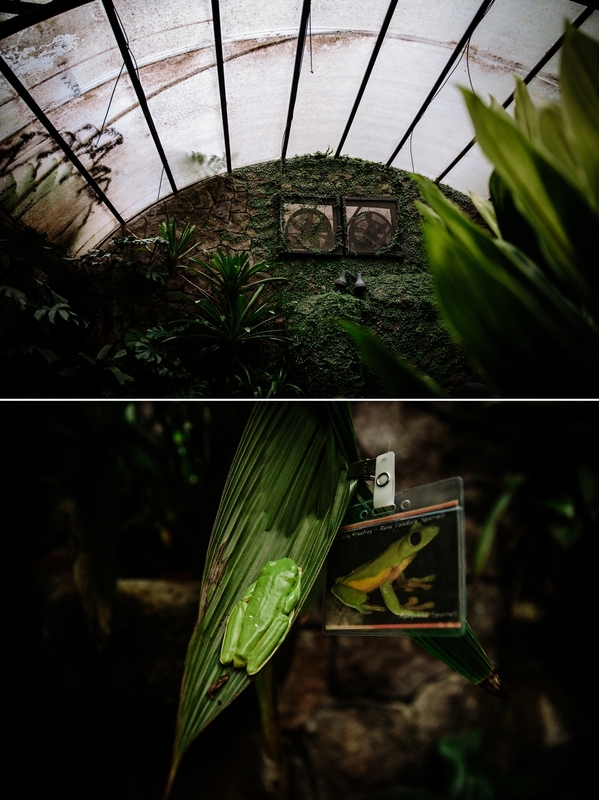 Last on our list at the Waterfall gardens…La Paz. The big one. We waited until this day to see it…and it was worth all the anticipation. After gawking at the waterfall for quite some time, we all made our way back to the shuttle bus to settle in for the long drive home. We had all admired the plush, mossy grass on the side of the road lining the country pastures and made it a point to pull over on the way back to the hotel. A thick blanket of fog was rolling over as we strolled down the road and hopped a barbed fence. Giddily, Ricky twirled Nessie a few times then swept her off her feet for a kiss. It was a scene straight out of the Princess Bride. When he picked her up, Ricky lost his tie clip. We searched in vain in the long grass for several minutes before surrendering. Ricky said it was only fair to give some kind of token back to this beautiful country. 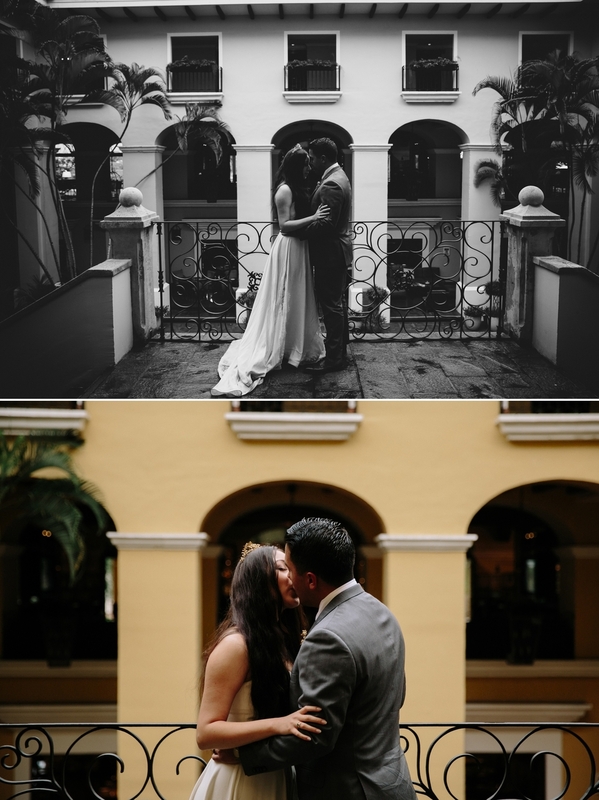 We were all exhausted and hungry by the time we arrived back at the Costa Rica Marriott, but mustered up a little more energy for the last few portraits. The sun was giving way to dusk and the hotel courtyard was quiet. We piled on the shuttle bus one last time to enjoy a meal together. 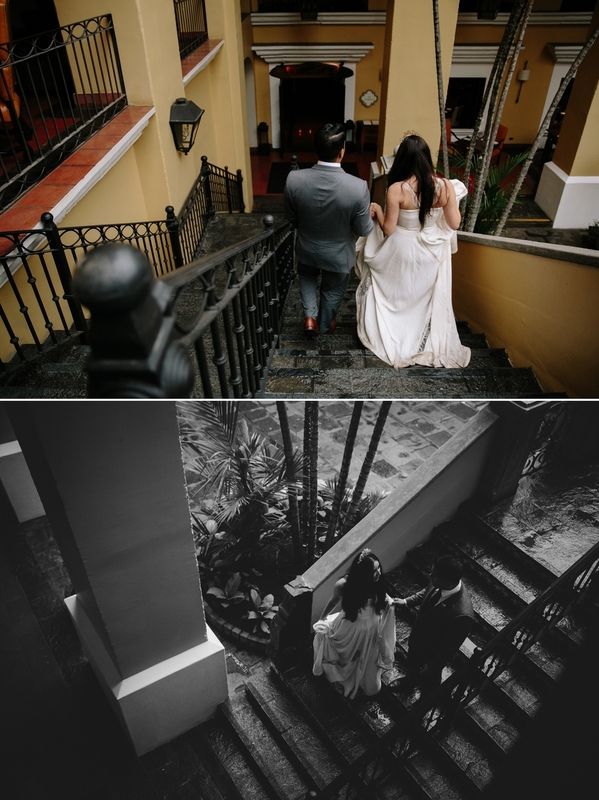 In typical Ricky fashion, he planned their reception dinner at one of the most renowned five-star restaurants in San Jose: Restaurante Grano de Oro. A story tale ending to a perfect trip. If you’ve made it this far in the post, you’ve earned the privilege to hear how this story ends. It’s pretty silly, but Ricky and I were both stressing for a few weeks leading up to the trip about these nasty little devils native to Costa Rica called botflies. I’ll spare you the details of these grotesque insects, but feel free to research if you’re interested. Every morning, I doused myself in the strongest bug spray I could find and somehow walked away completely unscathed from bites. We all did. Two days after I flew home, something crazy happened that I didn’t learn about until a week later. 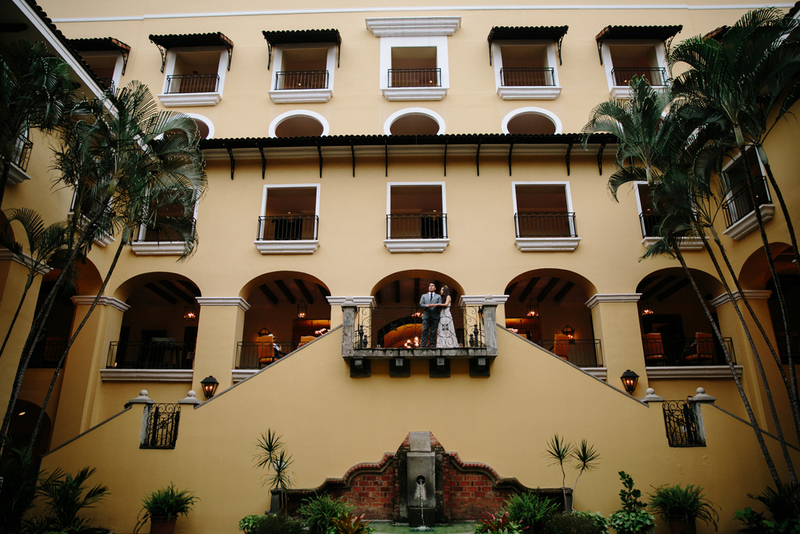 Ricky and Nessie extended their trip so they could enjoy their honeymoon in Costa Rica. 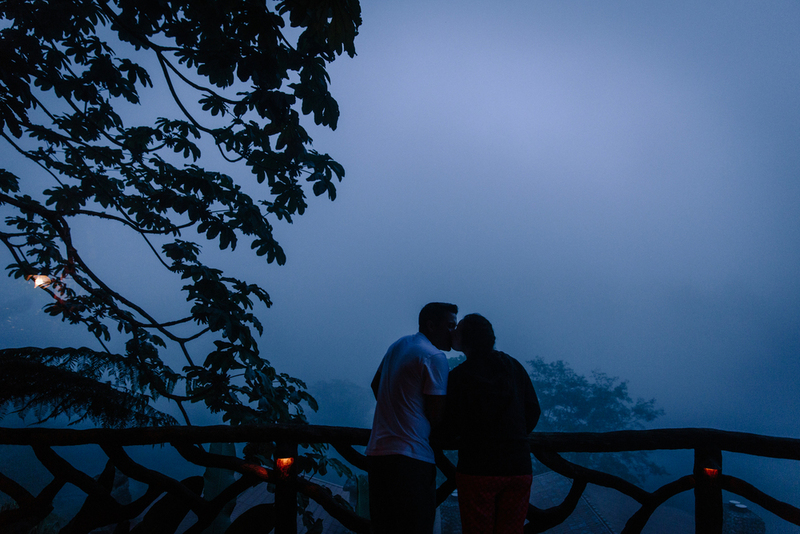 They were walking back to their hotel room at night when a snake fell from the tree overhead. Spooked, they called the hotel staff to come collect it. The hotel staff insisted to Ricky that the snake was perfectly harmless. He said it was the “fake” Coral snake- the non venomous version. Ricky believed him and picked it up. It swiftly bit him on the index finger and relaxed. They took some souvenir pictures with it and released it back in the wild. Upon returning to the room, Ricky said the bite really started to hurt. They did some quick computer research and immediately fell quiet. Turns out it was NOT a fake Coral snake. It was a real one. One of the deadliest snakes in the country. I’m happy to say Ricky is recovering quickly now. I can’t wait to join these two again at their formal reception later this month. Ricky and Nessie: Thank you so much for the memories and the best adventure I’ve had in years. Here’s to new friends and watching you fall more in love as the years go by. Congratulations! 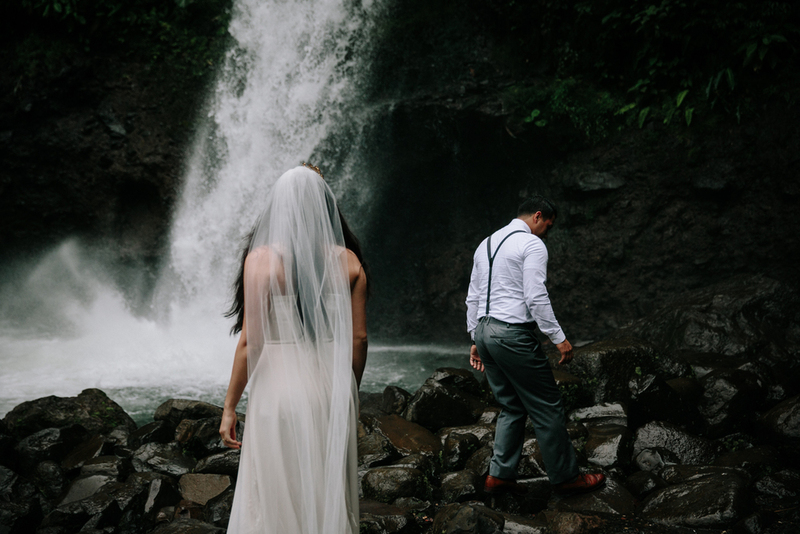 Ricky & Nessie’s Costa Rica wedding was published in the 2016 winter issue of The Knot. Check out the digital magazine here (pgs. 249, 280-285). 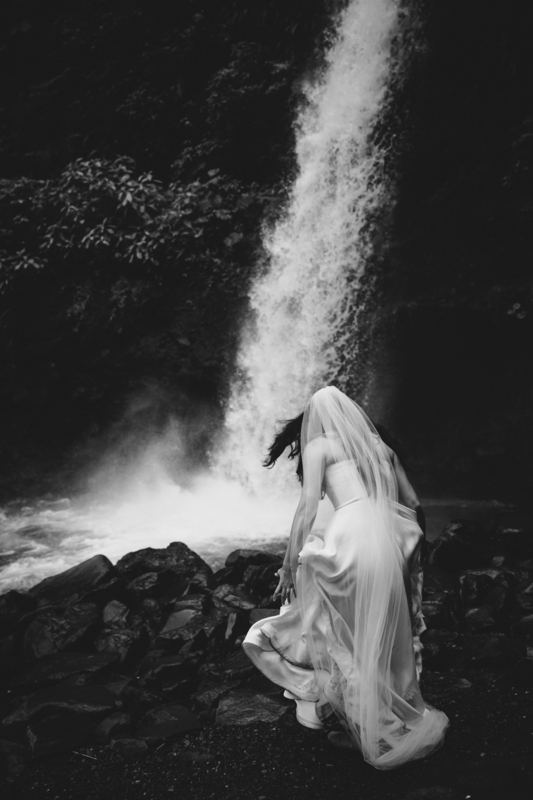 A couple months ago my now wife were planning an elopement in Yosemite and Big Sur. 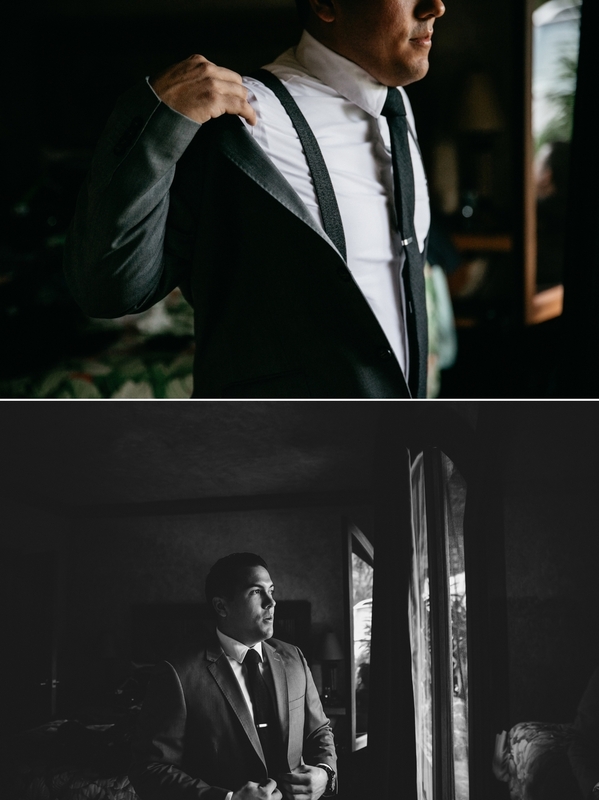 Vanessa began searching for a photographer and fell in love with the style of a very talented Paige Nelson. So I started corresponding with Paige and planning. 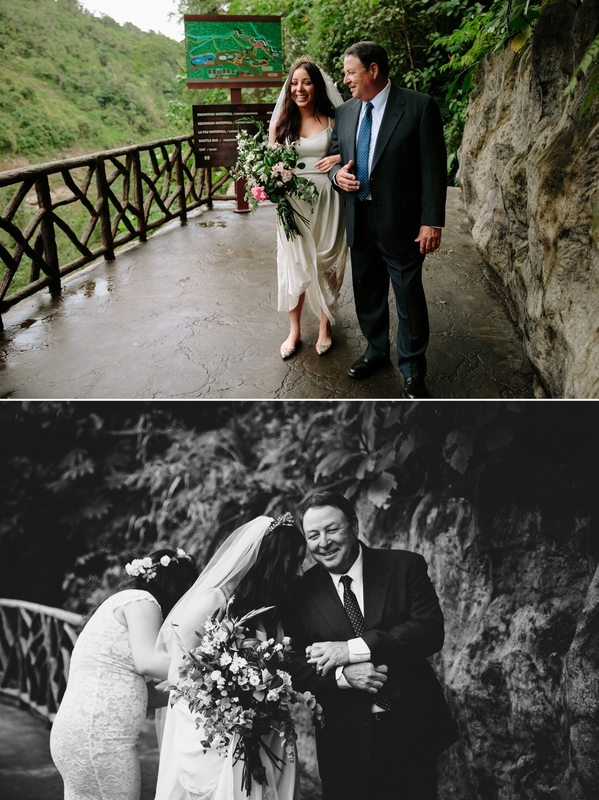 We changed direction on thought about having a big wedding with all of our family and friends. All the while I was planning a fitting way to ask the love of my life and soulmate a very important question. She said yes on March 31st, 2016.! After beginning to plan our wedding we decided we wanted an intimate wedding. It was then that I told Vanessa that I'd take her to Costa Rica, a dream of Vanessa's. 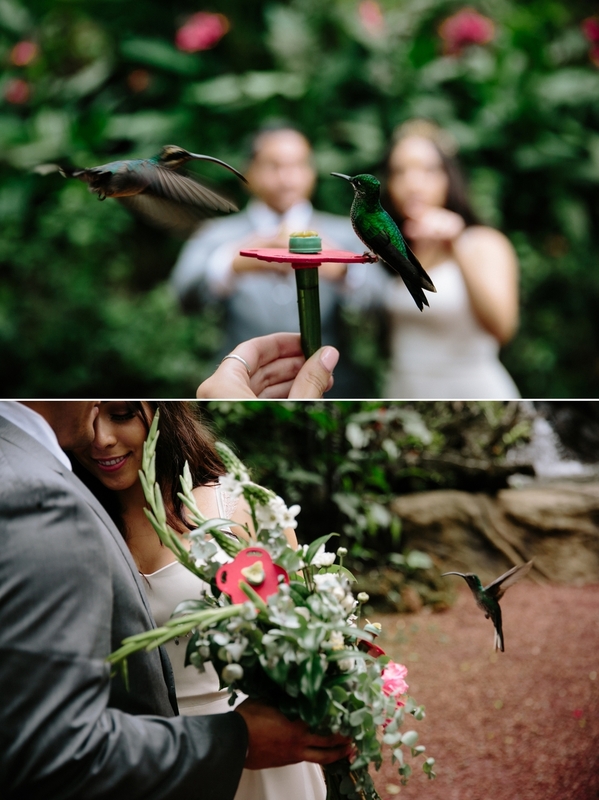 She loved the idea and we went to work planning our tropical wedding and honeymoon. 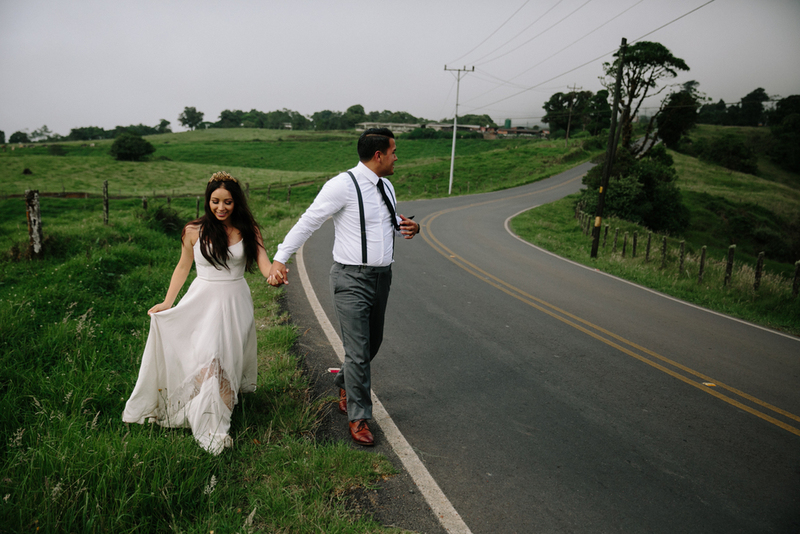 Vanessa started looking for a photographer in Costa Rica but none had the style that she loved. I knew how important these pictures would be to her so I reached out to Paige. I asked her how far was she willing to travel. She immediately replied, "As far as you're willing to take me!" That's all I needed to here. 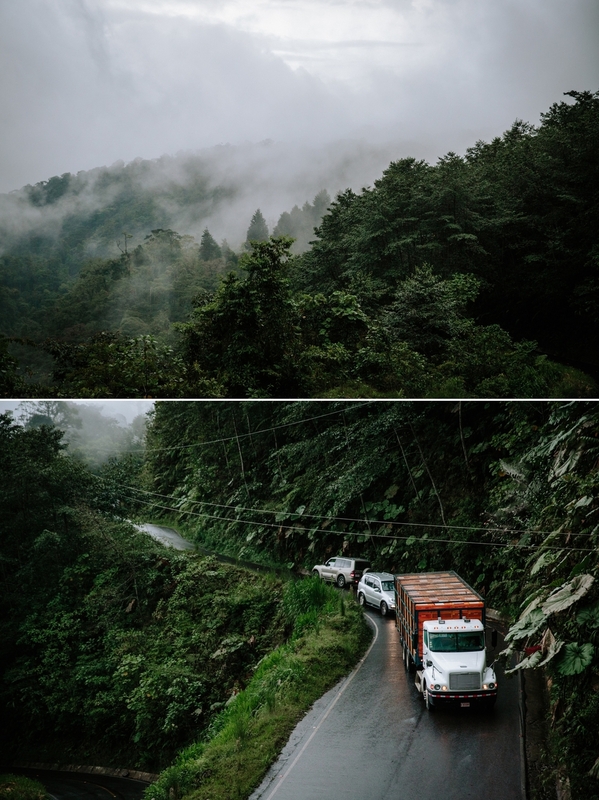 On June 10th we left Costa Rica. 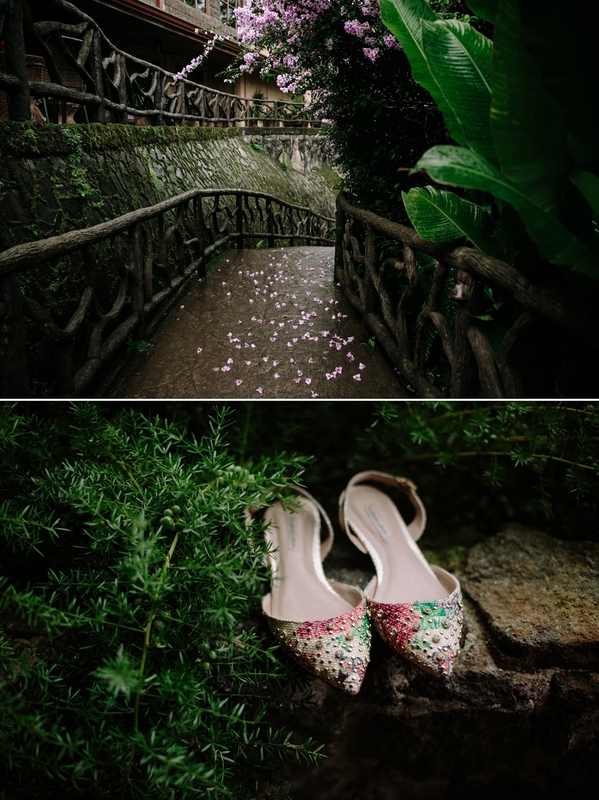 the first couple days we spent exploring this beautiful country with our family and our photographer and friend who I feel is now part of our family. On June 13th, 2016 Vanessa and I were married and the greatest adventure began. 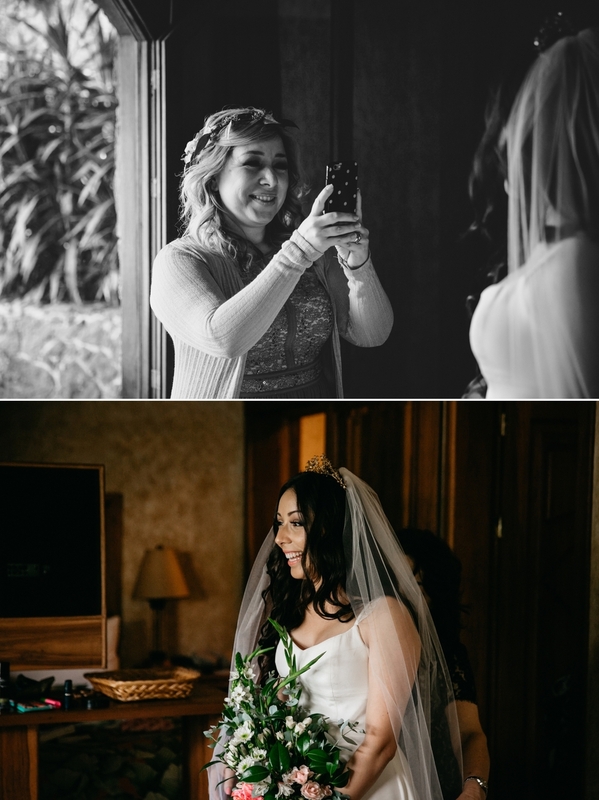 Thank you so much Paige for capturing our special day in a way we can relive these precious moments for the rest of our lives. You are such a talented photographer and a very genuine and down to earth person. We are so happy we chose you and are very happy to have made such a great friendship. Ps: I'm recovering nicely from the snake bite and complications after.